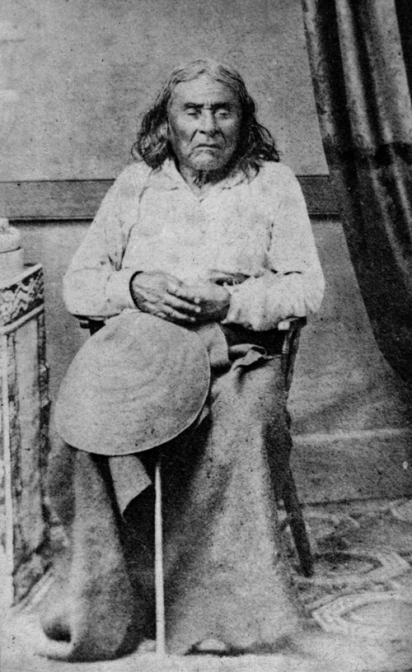 Chief Sealth, known to settlers as Chief Seattle. Photo: E.M. Sammis/MOHAI. Washington becomes a state. President Benjamin Harrison signed the bill admitting Washington to the union as the 42nd state on November 11, 1889. First salmon hatchery constructed. 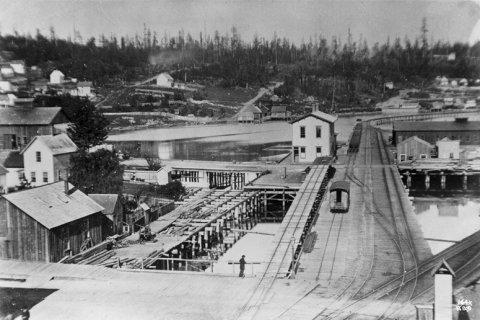 The first hatchery in Washington was built on the Kalama river. Hatcheries were originally constructed to make up for land use choices that altered fish habitat. Today there are 87 hatcheries operated by the Washington State Department of Fish and Wildlife, 51 tribal hatcheries, and 12 federal hatcheries. In addition to contributing to the state’s salmon harvest, hatcheries are now seen as a tool for rebuilding wild populations. First agricultural irrigation system in the Dungeness valley. Port Blakely in Kitsap county has the largest lumber mills in the world. Technological advances such as the band saw and steam donkey boost lumber production. Founded in 1864 by Nova Scotia sea captain William Renton, the Port Blakely Mill burned down – and was rebuilt – twice in the span of twenty years. Seattle's first railway station. Photo © MOHAI. White, Cedar and Black rivers re-routed. Prior to construction of the Ship Canal, Lake Washington drained into the Black River. 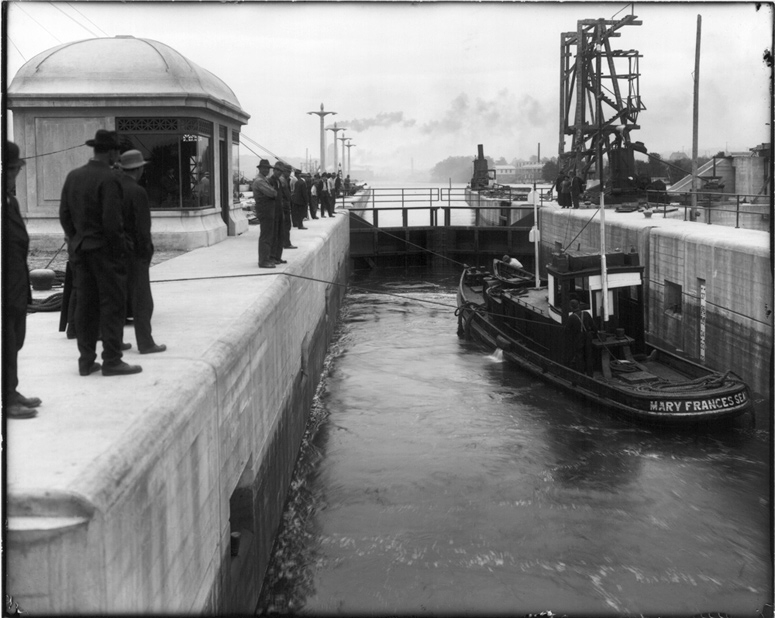 Between 1912 and 1917, the Cedar River, which joined with the Black River downstream of the Lake, was re-routed into Lake Washington, and the construction of the Ship Canal caused the Black River to dry up completely. Denny Regrade, 1907. Photo © Asahel Curtis/MOHAI. Peak period of the Denny Regrade: 16 million cubic yards were removed from Seattle hills, mostly by water blasting. About half of the spoils were deposited in the tideflats, forming Harbor Island. 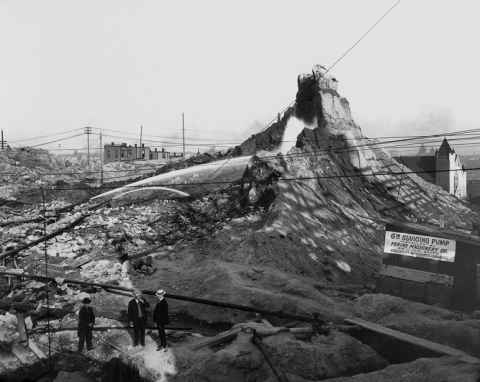 The project of erasing Denny Hill, a steep rise that engineer Reginald Heber Thomson believed was preventing the city from expanding northward, took over five years. Some property owners were reluctant to let go of their claims, but they found their houses stranded when Thomson simply carved away the land around unsold lots. Construction begins on Puyallup river levees. In order to protect agricultural fields from flooding, levees were added to the banks of the Puyallup river, eventually extending 90 miles into the Puyallup River system (including the Carbon and White rivers). 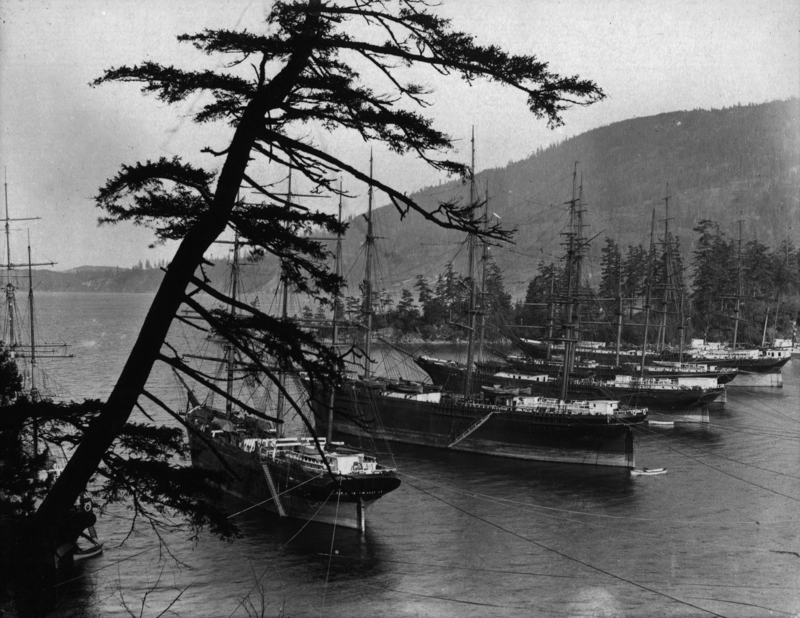 Cannery tenders in Chuckanut Bay, 1906. Photo source unknown. Peak cannery pack in Puget Sound with 2,583,463 cases of Pacific salmon. Puget Sound salmon hatcheries import eggs from the Columbia River. Ballard Locks completed, dropping level of Lake Washington by approximately 9 feet and eliminating substantial marsh habitat. Ballard Locks under construction, 1916. Photo © Webster & Stevens/MOHAI. Puget Sound Naval Shipyard undertakes major production of military ships during WWI. 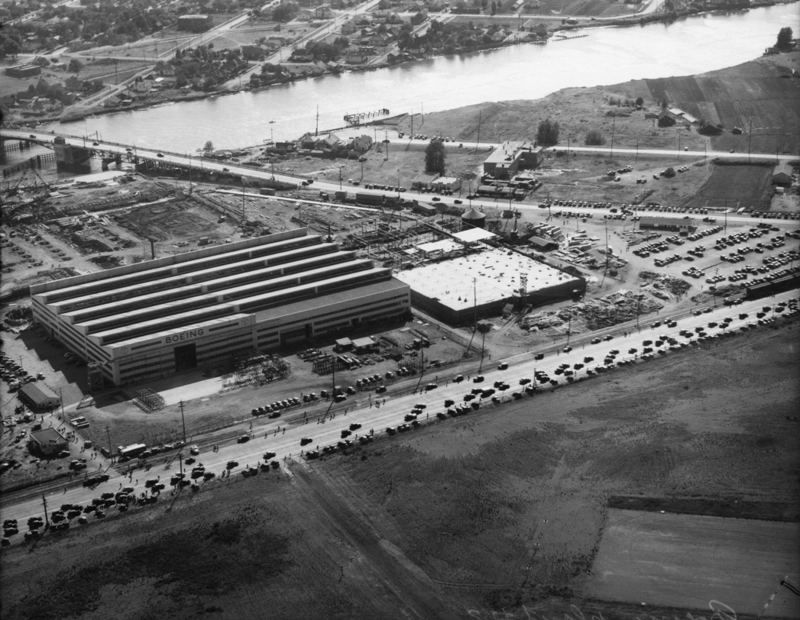 Aerial view of Boeing plant, 1943. Photo © Seattle P-I/MOHAI. Boeing Airplane Company is incorporated. William Boeing moved to the West Coast as a 22-year-old engineering graduate of Yale. His fascination with airplanes and flight led him to collaborate with George Conrad Westervelt, and together they designed the B&W biplane. In 1916, Boeing incorporated his company as the Pacific Aero Products Co., then changed the name to the Boeing Airplane Company the following year. Highway 101 constructed along the west side of Hood Canal, crossing all major river deltas. Dams built on Skokomish and Skagit systems. Manila clams introduced with shipments of Pacific oyster seed. These clams have acclimated to Puget Sound since their introduction from Japan, and are now commonly farmed and eaten all over the Northwest. All time peak of Washington lumber production at 7.5 billion board feet. One hatchery in the Green River is the source for 67.7% of Chinook releases throughout Puget Sound. 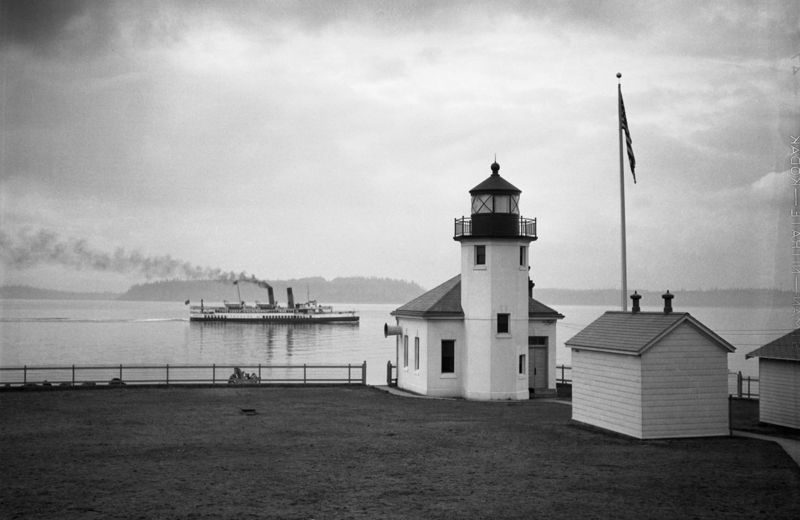 Alki Point Lighthouse, 1931. Photo © Seattle P-I/MOHAI. Puget Sound is major center for manufacturing and military staging during WWII. 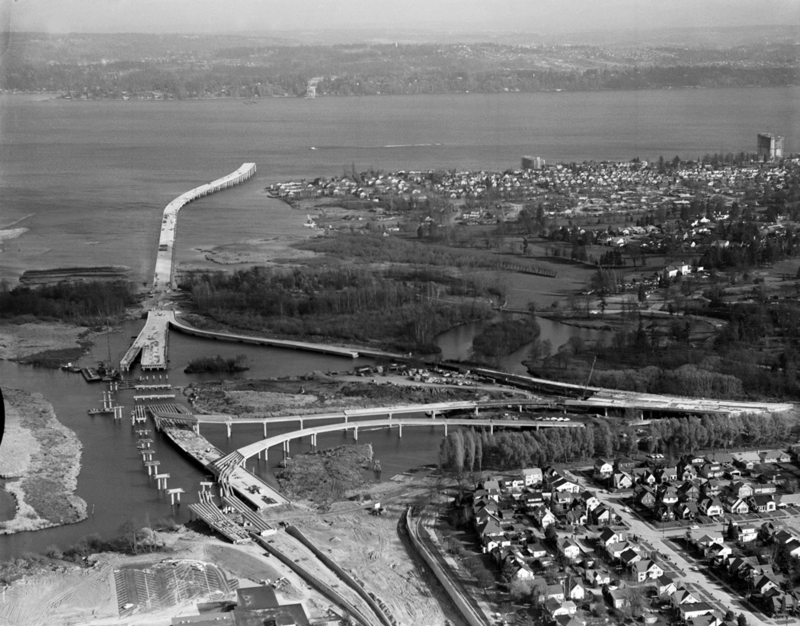 Evergreen Point Bridge under construction, 1963. Photo © Seattle P-I/MOHAI. 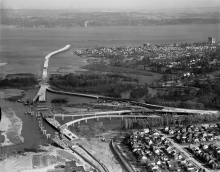 Major expansion of transportation infrastructure in Puget Sound including Interstate 5. Recreational fisheries expand following WWII. Recreational catch of Chinook in Puget Sound in 1957 estimated at 238,000. Cold War era boosts Boeing production. First oil refinery built on Puget Sound. According to a federal report, Puget Sound is the sixth most polluted area in the country. Flooding leads to expansion of levee systems along Cedar, Sammamish and other rivers. Howard Hanson Dam constructed on the Green River. Sewage effluent entering Lake Washington, once estimated at 20 million gallons per day, is diverted to Puget Sound. Peak contaminant levels in Puget Sound sediments. The manufacture of PCBs and several other toxic contaminants are banned nationally. 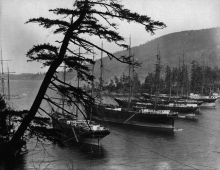 Construction of numerous bulkheads, docks, piers and revetments along central Puget Sound basin. Seattle is the second busiest container port in the U.S. and sixth busiest in the world. Industry giant IBM selects tiny Microsoft’s MS-DOS as the operating system for their new personal computer. Endangered Species Act listing of Puget Sound Chinook is the first major listing affecting an urban area. Draft recovery plan completed in 2005. Human population of Puget Sound estimated at 3.8 million. Southern resident orca population listed as endangered. An additional 1.4 million residents expected, bringing the combined total of Puget Sound and the Georgia Basin to over 7 million.